I can’t really get into FOOD extreme couponing. It’s kind of hard to do when all your husband wants to eat is fresh fruit and veggies. BUT things like PASTA are most certainly on my list of things to buy each week and I found out a way to at least get that for free. 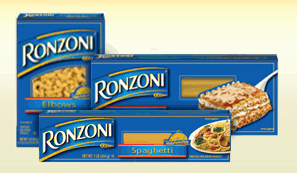 Ronzoni usually has $.50 off coupons on their website. You have to check back often (and I do). When it comes around – go to a few different computers and print at least 6 of them. Only have one computer? Ask a friend to do it for you. You should try to print at least 6 to make it all worth it. Wait for a sale that is 10 for $10 at your supermarket. This puppy comes around every few weeks (if not sooner). Bring in the coupons and rejoice in the fact that almost every supermarket doubles up to a dollar. WHICH MAKES YOUR RONZONI PASTA FREE! You have to be careful about the type of pasta you are purchasing – sometimes certain versions aren’t included in the 10 for $10. If that’s the case, I just buy what I can and store it in my pantry. You have no idea how much pasta I have in this house right now because this sale really isn’t a rare one. It happens ALL the TIME!